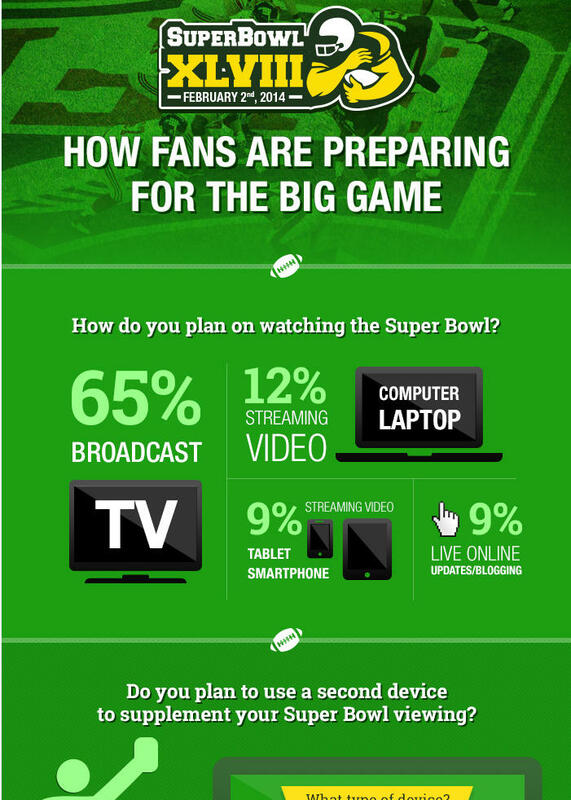 Super Bowl Survey - How are Consumers Going to Watch the Super Bowl? Another emerging trend is the use of the ‘2nd screen,’ such as a tablet or smartphone, to supplement viewing. Results show that viewers who plan to use a 2nd screen while watching the game are significantly more likely to engage with an advertiser’s brand. Those viewers planning to use a 2nd screen report being 3 times more likely to engage with an advertiser’s brand on social media and are more than twice as likely to visit an advertiser’s website and purchase a product. 40% of viewers plan to use a 2nd screen to supplement viewing, with 23% planning to check team/player stats and 17% planning to follow on social media. Facebook is the platform of choice for those planning to use social media: 31% plan to use Facebook, 18% Twitter, followed by Google+, YouTube and Instagram.